This story is featured in the Fall 2016 edition of the HPU Magazine. 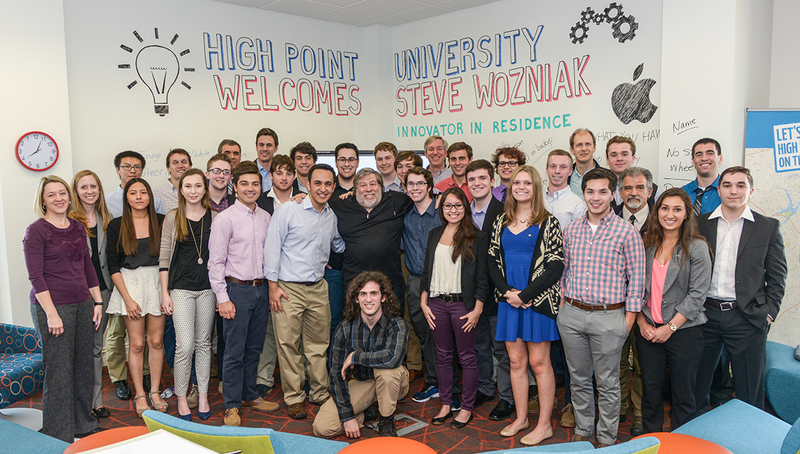 HPU students are granted access to global innovators, including Apple co-founder Steve Wozniak. 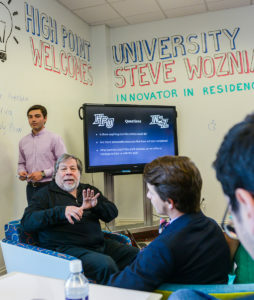 As Wozniak begins his role as “Innovator in Residence” at HPU, students come to know the genius behind Apple Computer as a mentor and a friend. Mandy Engelman could barely believe her eyes. She was sitting in a bright blue chair inside the Belk Entrepreneurship Center, and just an arm’s length away sat Steve Wozniak, the co-founder of Apple Computer. The center was filled with students soaking up Wozniak’s wisdom. After all, his invention paved the way for the iPhones in their pockets and the laptops in their backpacks. Yet there he was, in the middle of this circle of students, answering questions with the excitement and energy of someone inventing something new for the first time. Computer science and physics students were working on a mobile driverless kiosk that could make deliveries around campus. Every question they asked, Wozniak answered. He did more, too. He interjected his own questions, shared his vision for the possibilities of their work and offered new ways to think about their goal. His ideas poured out like water rushing down a river. Just like in the fall, when Netflix co-founder Marc Randolph visited students, Engelman found herself blinking in disbelief that in her first year of college, she was talking to a worldwide influencer right here on campus. 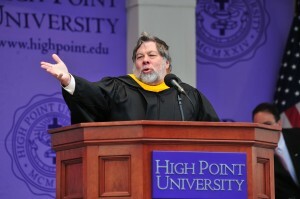 Wozniak first came to HPU in 2013 when he served as the Commencement speaker and took part in a discussion with Dr. Nido Qubein, HPU president, for North Carolina public television. They talked about breakthroughs in technology and the future of education, including the Montlieu Academy of Technology iPad Project. 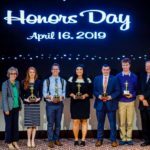 HPU committed funds and resources to putting iPads into the hands of every student through the project, and Montlieu went on to be named an Apple Distinguished School. 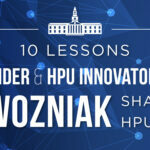 Ever since his first visit, Wozniak has been an HPU advocate, and that led him to join the university as the first Innovator in Residence. In his ongoing visits to campus, he’ll connect with students and faculty through a variety of hands-on projects and act as a consultant, teacher and motivator. He began his new role on campus last spring inside the Hayworth Fine Arts Center. 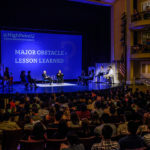 Twelve students representing communication, education, physics, computer science and entrepreneurship majors sat at high-top tables on the stage along with Wozniak, while Qubein moderated an interactive question-and-answer session with 600 people filling the audience. A hot pink spotlight shone on each student when it was their turn to pick Wozniak’s brain. “What should students do if they want to run their own startup but are also getting job offers from major companies?” one asked. “What’s a major obstacle you overcame, and what did it teach you?” asked another. 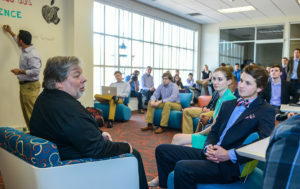 Wozniak’s next stop on campus was Cottrell Hall for a surprise coffee session with students, who lined the hallways in a moment’s notice to meet the man credited for building the first personal computer. 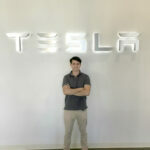 He embraced every moment to take photos with them, chat and sign their iPhones and MacBooks before he headed to the Entrepreneurship Center to lead a workshop with students. And then it was time to talk technology. Wozniak sat in the middle of the students while computer science major Reza Moghtaderi sketched project plans for the mobile kiosk on dry erase walls that wrap around the center. They used words like “accentuators” and “proximity sensors” as questions bounced back and forth from students to Wozniak, and from Wozniak back to students. People around the room chimed in on the different aspects of the machine. Yet Wozniak wove the pragmatic advice needed to take a project from idea to reality through the technological details. Moghtaderi graduated in May, but he still carries his iPhone that Wozniak signed, along with the lessons he gleaned from “the Woz,” as computer science majors have come to call him. 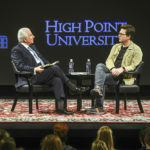 “High Point has allowed me to talk to co-founders of so many great companies — Netflix, Twitter, Apple. When you hear first-hand from them how they did it, and when they give you advice on your personal goals and projects, it’s meaningful. Wozniak helped us take our project in the right direction and gave us milestones to guide us through the next steps. Wozniak’s role as Innovator in Residence may be new, but the mindset behind it isn’t new to campus. 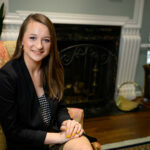 For more than a decade, HPU has connected students with some of the most influential leaders of our time. The list of those influencers who’ve visited is long: Twitter co-founder Biz Stone; Netflix co-founder Marc Randolph; marketing guru and former Yahoo Vice President Seth Godin; New York Times columnist and best-selling author Malcolm Gladwell; former Secretary of State and chairman of the Joint Chiefs of Staff Gen. Colin Powell; former First Lady Laura Bush; CNN Correspondent Pamela Brown; futurist and expert on aging Dr. Ken Dychtwald; and the list continues. 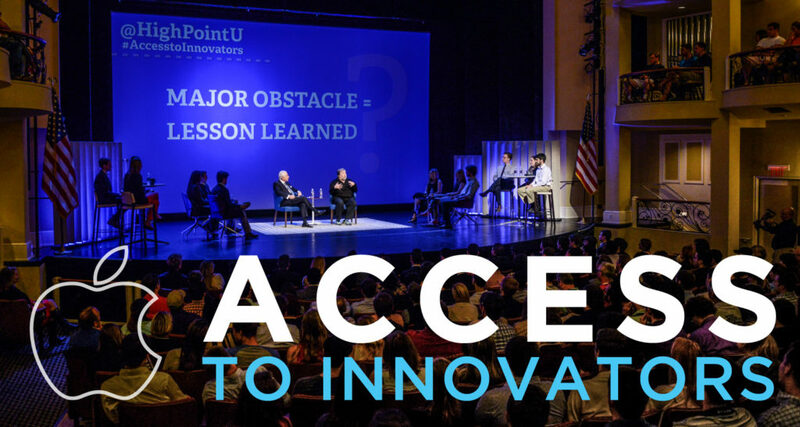 But giving students unprecedented access to innovators takes place almost daily on campus. Why? Because leaders at the university know major companies and organizations invest millions of dollars to expose their employees to these experts. So HPU brings in the same industry leaders to give students an academic and executive education in tandem. Like Marilyn Sherman, known as the “Front Row Girl.” She travels the world inspiring people to get out of their comfort zone, overcome obstacles, take a front-row seat in life and reach their true potential. She’s worked her magic on teams at Coca-Cola, Mass Mutual Life Insurance, Marriott, the United States Army, Starbucks, NASA’s Kennedy Space Center, Big Brothers Big Sisters of America and dozens more. 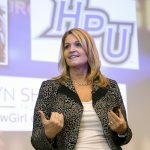 At HPU, she inspired students and their parents during a multi-day visit that culminated in a Family Weekend presentation. Entrepreneurs come to campus too, like the owners of Ace and Everett, a high-end sock maker that manufactures their product in the city of High Point. Cody and Sage Disch, both in their 20s, invigorated students with the story of their company’s founding and the message that anyone — regardless of age — can turn big dreams into a relevant, sought-after venture. It’s a part of HPU’s distinguished learning model. It ensures that when students graduate, they’ve built a network with the disruptors and change agents of the world. And they’ve learned the most valuable lesson of all: the art of the possible. The simple notion that they can do it, too. 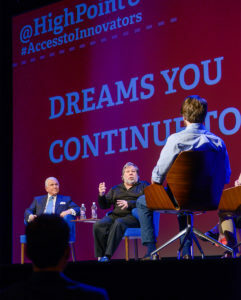 Like Engelman, the entrepreneurship major who once pitched her business plan to the Netflix co-founder inside the Entrepreneurship Center, and then sat a foot away from Wozniak as he opened his heart and his mind to students.